Let’s talk cookies. And let’s make ’em Valentine’s Day themed. Last Valentine’s Day, I told my boyfriend that I didn’t want anything because I thought Valentines Day was stupid. I’ve always thought it was a bit silly because, like I said, I want affection and attention year-round, not just on Valentines Day. Anyway, I asked for nothing and guess what I got? Nothing. And guess what I realized? It ain’t as stupid as I thought. I was not a happy gal! But at the same time, I asked for it! Moral of the story, ladies, you really do care about Valentines Day. Men, just go out and buy some flowers, will ya? They’re twelve bucks at the grocery store and just as nice as a florist. Also, if you say you want nothing, you will get nothing and you won’t be happy about it. 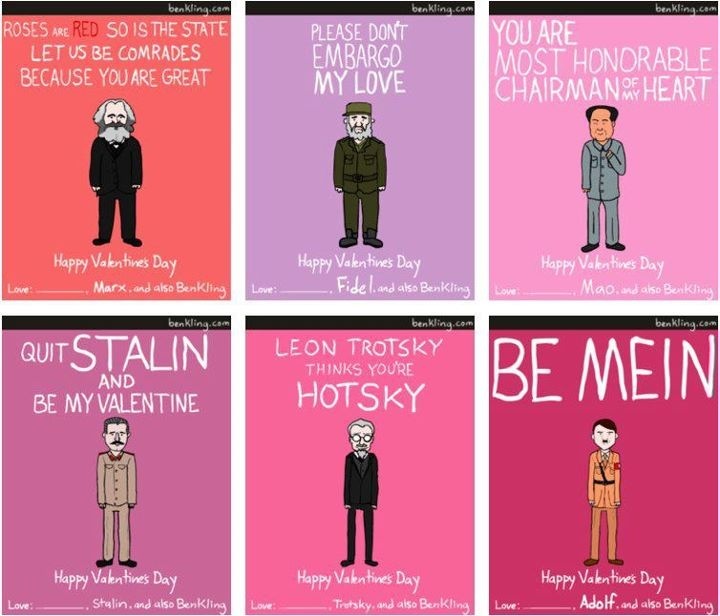 Valentine’s Day is one of the most divided topics, I think, in our society. People get so heated over the holiday. I got into a fiery conversation about it yesterday. Some men feel pressure because society has built it up to be the biggest day for romance of the year. Also because of how commercialized the day has become, some women can have high expectations about what they want for the holiday, thus putting way too much pressure on their significant other. Neither of these kind of people will enjoy Valentine’s Day acting like that. And to these people I say grow up because life ain’t no Disney Princess movie, get some take out, and just enough eachother’s company. Some people don’t like the holiday because it can be viewed as a day where a women relies solely on a man for happiness. Some ladies are like, I can buy my own chocolate and bake my own M&M cookies. I don’t need a maaaaaaan to do it. And some men are like, I like an independent women who doesn’t rely on me as her only source of happiness. Because of that I don’t believe in Valentine’s Day. To those men, I say shoo, shoo! It ain’t about that! Wanting to be all sappy and love-dovey can have absolutely nothing to do with “relying on a man for a source of happiness.” And to those ladies, I say refer to my story above. 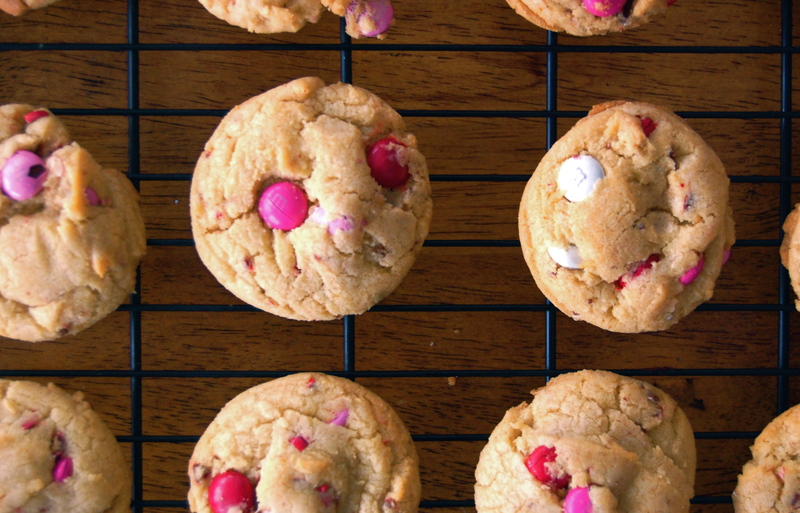 Believe me, you’d rather have someone you care about bake you some cookies and eat them together rather than sit alone and bitter on the couch, easily downing a dozen while watching a Law & Order SVU Marathon. Valentine’s day isn’t about flowers, chocolates, and giant stuffed animals. It was initially a day to celebrate Saint Valentinus, who was imprisoned for performing weddings for soldiers, who were forbidden to marry. I mean, how cute is that? It wasn’t until Geoffrey Chaucer came along that it became associated lavish gestures of romance. So, if you want someone to blame for your Valentine’s Day troubles, blame Chaucer. He’s the real perp here. So what does this all have to do with cookies? This year, forego the flowers, jewelry, and chocolate, and give something special to someone even more special. I think that homemade gifts are the best way to express how much you care about someone. And if it involves food, even better. Directions: Sift together the flours, baking powder, baking soda, and salt and set aside. In a mixing bowl, cream together the butter and sugars until fluffy, about 3 minutes. Then add in the eggs, one at a time. Once the eggs are incorporated, mix in the vanilla extract. Slowly add the dry ingredients to the wet ingredients. 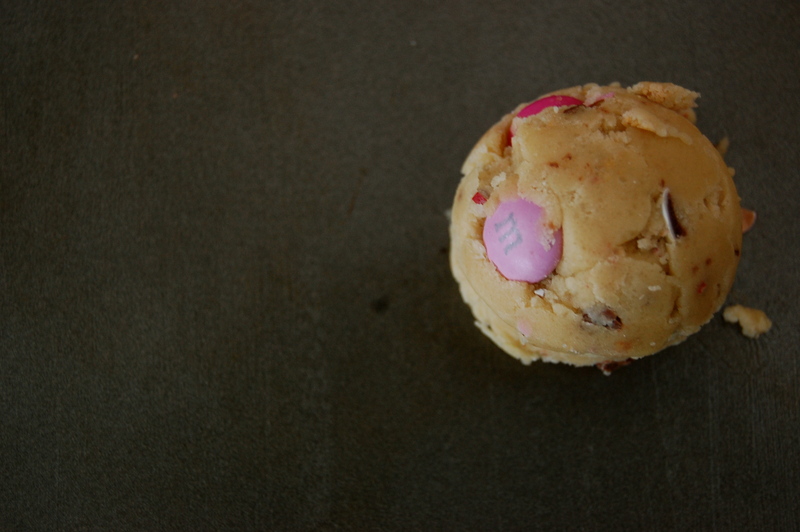 When the dough is just coming together, fold in the M&M’s and mix until all ingredients are incorporated. Refrigerate the dough for at least 24 hours. 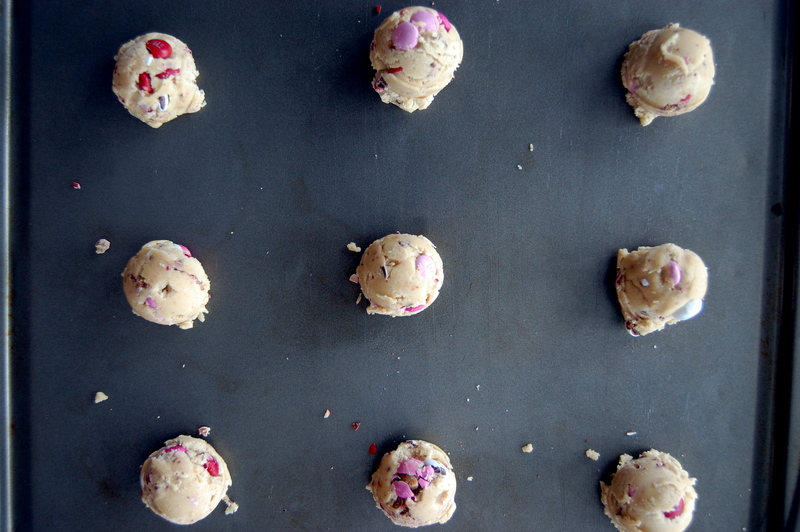 Refrigerating the dough will help the cookies keep their shape when they’re baked. 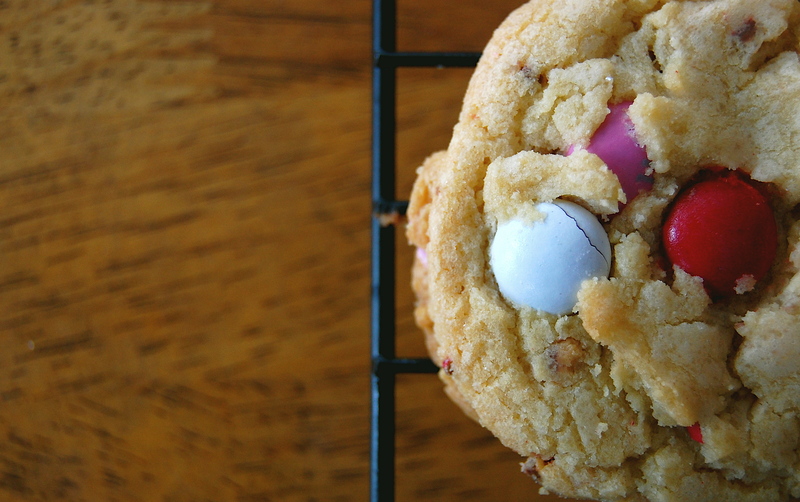 This also ensures a soft, chewer cookie that is just crisp enough around the edges. The perfect cookie. After 24 hours, preheat the oven to 350 degrees fahrenheit. I used a tablespoons melon baller to scoop out even sized cookies. Bake for 10-12 minutes. 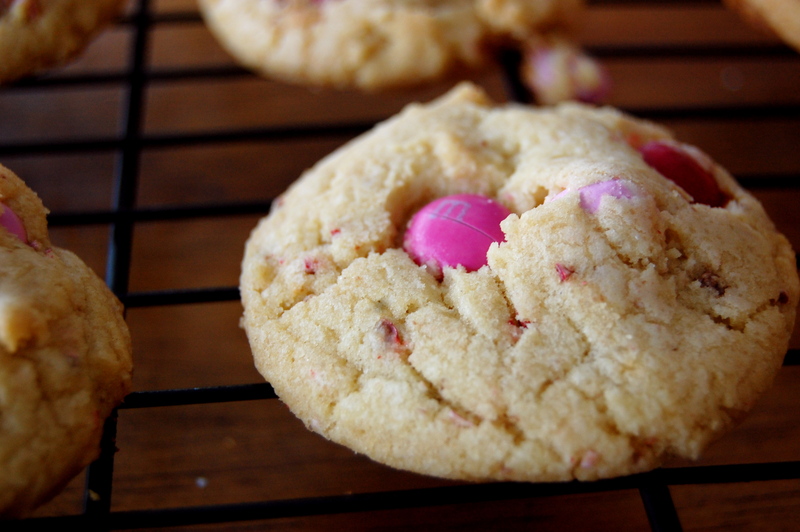 For extra soft cookies, cook for 9 minutes, until the edges are just firm enough. Let cool and eat up!